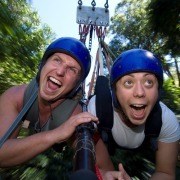 Created in the late 1980s, AJ Hackett International has gained a reputation as a world leader in the adventure tourism industry. 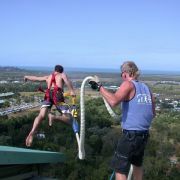 The AJ Hackett Cairns Bungy tower was the first purpose-built bungy tower in the world, which opened on August 11, 1990. 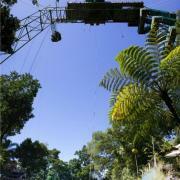 In 2000, the Minjin – the world’s biggest jungle swing – opened at the Cairns site. 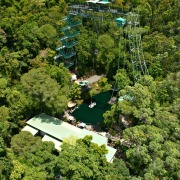 Situated 15kms from the CBD on the foothills of Saddleback Mountain, the tower stands 50 metres above a 5m-metre-deep pool. 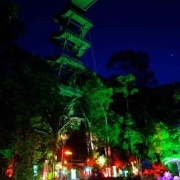 The site has purpose-built reception area, bar, viewing decks, Minjin Jungle Swing and an outdoor amphitheatre. 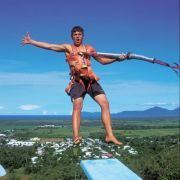 Cairns is the only Bungy site in the world to offer a world class Jump Menu allowing Bungy enthusiasts to Jump 16 different styles, from the classic swan dive to a running roof jump. 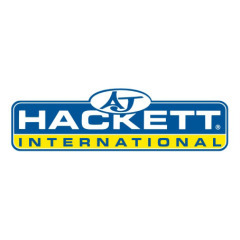 All activity related equipment used by AJ Hackett International is of the highest available manufacturing standards. 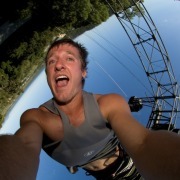 All bungy cords are manufactured specifically for each site by AJ Hackett. World's ONLY site that offers a BMX jump off the Tower roof!